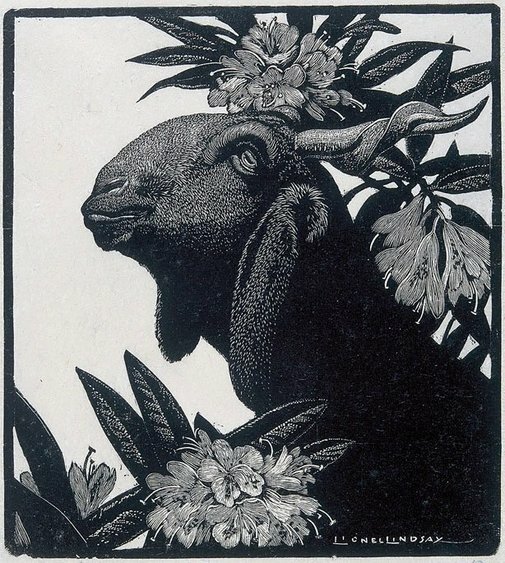 Lionel Lindsay produced the most impressive and consistent oeuvre of wood engravings in Australia, 'Goat and rhododendron' being one of the boldest and most popular. The Gallery has a significant collection of Lindsay's graphic work, including over 60 wood engravings and 100 etchings. 'My method is very simple. From a careful pencil study I place my principal object; carefully drawing a precise outline. I blacken the intervening space and start by establishing my largest lights; finding direction, modelling and strength of line on the block. I prove as I go, building up my design from what elements I have already considered necessary, bit by bit. I gamble with the ultimate result, but my chief care is to establish a true graver cut, keep its drawing quality and to preserve the intervening black. I keep thus to a classic ideal' (J S Macdonald, 'The woodcuts of Lionel Lindsay', The print collectors quarterly, vol.21, no.2 (April 1934), pg.180). This print was exhibited in April 1934 at P & D Colnaghi and Co, London as 'Syrian goat and Rhododendrons' ('Wood-engravings by Lionel Lindsay', cat.no. 52). Signed within block to print l.r., "LIONEL LINDSAY". Bruce James, Art Gallery of New South Wales handbook , 'Australian Collection: Works on Paper', pg. 182-197, Sydney, 1999, 194 (colour illus.). Hendrik Kolenberg, Look , 'Australian Prints from the Collection 139 of the best', pg. 26-27, Heidelberg, Nov 1998, 27. 150 years of Australian art , Sydney, 1938. cat.no. 511; titled 'The black goat'. Anne Ryan, Look , 'When prints ruled', pg. 25-27, Sydney, May 2007, 25 (illus.). Australian woodcuts and linocuts of the 1920s and 1930s , South Melbourne, 1976, 10, 20 (colour illus.). Collection of Mr Peter Lindsay, Sydney.